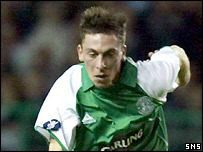 Hibernian trio Scott Brown, Kevin Thomson and Ivan Sproule have all signed extended deals at Easter Road. Brown, 20, and Sproule, 25, are under contract until 2009, with 21-year-old Thomson's deal going one year further. "It's good that they all see Easter Road as the right place for their continued development," Hibs manager Tony Mowbray told the club website. "These new deals demonstrate that we are already planning ahead for next season and beyond." Hibs will pocket £1.6m from Garry O'Connor's transfer to Lokomotiv Moscow, but Mowbray added: "We have been talking with the players for a couple of months, it just so happens that it's been agreed this week. "It's not a case of three being offered deals as one goes out the door. "You have to start talking with their advisers first and I have to make the first move so talks have been ongoing for a while. "The club are having relative success at the moment, the crowds are coming back and so there is the revenue there to keep young players." Brown and Sproule agreed deals just last summer but the new agreements add an extra year to both men's contracts. Meanwhile, Thomson has added three years to the last contract he penned. "It is a coup to get these players to extend their contracts," added Mowbray. "Their form has warranted it and we are delighted that they have agreed to stay, especially after a time when Brown and Thomson have come under a great deal of speculation about their futures. "There are no clauses in their contracts. In fact there are no clauses in any of the players' contracts at Hibs. "If their performances are good and we get an offer for any of them, like we did with Garry O'Connor, then we will consider it." Thomson has been in excellent form during this campaign after returning at the tail end of last season from almost a year out with cruciate ligament damage. Brown is currently out of action with a broken leg but is expected to return in time for the Scottish Cup semi-final with Hearts on 2 April. Pacy winger Sproule has enjoyed a wonderful time since his £5,000 move from Irish League side Institute last season. He was the subject of a £1m offer from Ukrainian club Dnipro and scored on his first start for Northern Ireland earlier this month.